It's in hudlayout.res in the section 'HudDeathNotice'. Fire Firehow do i (re)move the "beat blus time to win" thing ? [quote=Fire][quote=Fire]how do i (re)move the "beat blus time to win" thing ? Fire Fire Firehow do i (re)move the "beat blus time to win" thing ? Should be in HudTeamGoalTournament.res, everything under "HudStopWatchObjective"
[quote=Fire][quote=Fire][quote=Fire]how do i (re)move the "beat blus time to win" thing ? omni Fire Fire Firehow do i (re)move the "beat blus time to win" thing ? [quote=omni][quote=Fire][quote=Fire][quote=Fire]how do i (re)move the "beat blus time to win" thing ? Animated background in main menu. It's real or dream? DisquseAnimated background in main menu. It's real or dream? .vtf gifs should be possible, flatHUD has it implemented, not sure if it's possible on the main menu though, i think it is. b4stian DisquseAnimated background in main menu. It's real or dream? .vtf gifs should be possible, flatHUD has it implemented, not sure if it's possible on the main menu though, i think it is. Yea. I know about flathud's load animations. I do that on my hud. But I can't do animation background in mainmenu. YEAS! I DO THAT! ANIMATED BACKGROUND IN MAINMENU! Is there anyway to move the votebox down? As you can see here, it's blocking my spectator health. Is there anyway to move the votebox down? As you can see [url=http://imgur.com/MVOBrFC]here[/url], it's blocking my spectator health. Hi I'm currently using BlackHud and I want to change low ammo color... how do I do that ? does someone know how to enable medpack/sandvich pickup notification in broesel hud ? MonsignorRoninHi I'm currently using BlackHud and I want to change low ammo color... how do I do that ? Open hudanimations_tf.txt and found "event HudHealthDyingPulse" change fg color. I think it's impossible. Cuz dat windows configured on the server side. Does anyone know what the event name for Vaccinator übers is? The little bars all change colour when you get a "quarter über" and the number ticks up, so I assume there must be a name for it somewhere, even if I can't find it. And I guess on a more general note: Is there a way to find the name of any event you're curious about outside of looking it up somewhere on the Internet or finding it in hudanimations_tf? Thank you in advance. (I think it's 0 that makes it work, it's arbitrary) to line up with the little shadow text in the middle, the targetid for who is being healed is equally as messed up as the regular targetid in the first image. The problem with changing the xpos value is that it moves both of those values and only lets one of them be aligned. I guess I'm more-or-less asking what can I add to make it so both values exist. If I move [img]http://puu.sh/egnvp/4b9dfaa602.png[/img] (I think it's 0 that makes it work, it's arbitrary) to line up with the little shadow text in the middle, the targetid for who is being healed is equally as messed up as the regular targetid in the first image. How do i edit the white lines on the scoreboard? Can't find the hud elements on vgui_drawtree, even with +showscores in console. Thanks. m0nkeiHow do i edit the white lines on the scoreboard? Can't find the hud elements on vgui_drawtree, even with +showscores in console. Thanks. In hudlayout.res, search for HudHintDisplay. Is there an easy way to add those server shortcuts to the main menu in any hud or is that just an option in Rays? So I played randomizer today, and I noticed this. So I played randomizer today, and I noticed [url=http://imgur.com/Na0tiHk]this[/url]. 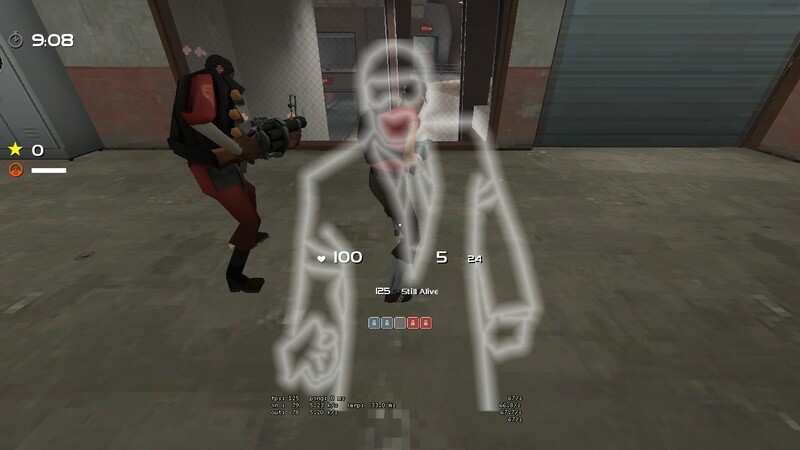 How i can fix target id and remove that spy when i disguise. They are just buttons that have the command of "connect SERVER". If you don't know how to do that check out doodles in-depth sections on buttons and main menu. Or you could just edit the buttons with whatever servers you want them to join. not aware whether or not you can remove it but you can definitely make it smaller. under "Smaller disguise outline" there are instructions as to how to do so. It was an option in the old flathud, which is a heavily modified rayshud. I could show you how i did it, add me on Steam. Bumping my question with my scoreboard file. Sorry for the repost. How do i edit the white lines? Thanks in advance. Bumping my question with [url=http://pastebin.com/C5muUtiz]my scoreboard file[/url]. Sorry for the repost. How do i edit the white lines? Thanks in advance. is it possible to make a MainMenu button that opens url in the overlay web browser? Any ideas guys? m0nkeiBumping my question with my scoreboard file. Sorry for the repost. How do i edit the white lines? Thanks in advance. They're part of Blue/RedPlayerList. I don't think you can edit themselves. [quote=m0nkei]Bumping my question with [url=http://pastebin.com/C5muUtiz]my scoreboard file[/url]. Sorry for the repost. How do i edit the white lines? Thanks in advance.